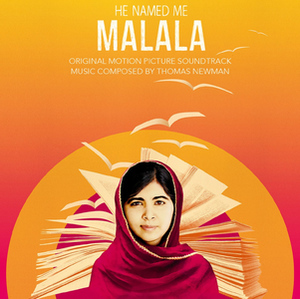 Sony Music proudly announces the release of HE NAMED ME MALALA (Original Motion Picture Soundtrack). Multiple Grammy© winner Thomas Newman has written the score for the film. The soundtrack will be available digitally September 25th 2015 / physically October 9th 2015. HE NAMED ME MALALA opens in select theatres in New York and Los Angeles on October 2nd, 2015 and everywhere October 9th, 2015. HE NAMED ME MALALA is an intimate portrait of Nobel Peace Prize Laureate Malala Yousafzai, who was targeted by the Taliban and severely wounded by a gunshot when returning home on her school bus in Pakistan's Swat Valley. The then 15-year-old (she turned 18 this July) was singled out, along with her father, for advocating for girls' education, and the attack on her sparked an outcry from supporters around the world. She miraculously survived and is now a leading campaigner for girls' education globally as co-founder of the Malala Fund. Acclaimed documentary filmmaker Davis Guggenheim (An Inconvenient Truth, Waiting for Superman) shows us how Malala, her father Zia and her family are committed to fighting for education for all girls worldwide. The film gives us an inside glimpse into this extraordinary young girl's life – from her close relationship with her father who inspired her love for education, to her impassioned speeches at the UN, to her everyday life with her parents and brothers. About the soundtrack, Davis Guggenheim (director/producer HE NAMED ME MALALA) said: "Documentaries can be deceptively hard work because they are seen more as an act of journalism than craft. Tom [Thomas Newman] threw himself completely into the score of HE NAMED ME MALALA, suffering every detail, demanding that we get every moment right. What I witnessed watching him in his studio was pure artistry. When sitting and listening to his music for the first time I was overwhelmed by the raw power of his open soaring expression. His music brought the film to life pulling the characters' emotional inner lives to the surface, threading and bonding the story together and allowing it to be fully realized." Thomas Newman is one of the most respected composers in the film and concert worlds. With an illustrious career of over 30 years, Newman has scored more than 70 feature films. Coming from a prominent musical dynasty – his father was the renowned composer Alfred Newman, and singer/songwriter/composer Randy Newman is his cousin – Thomas Newman has thus far been nominated for 12 Academy® Awards and has won an Emmy® Award, 2 BAFTA Awards and 6 Grammy® Awards. Newman has composed the scores for many other notable films, including American Beauty, Skyfall, Erin Brockovich, The Good German, Finding Nemo and Wall-E for Pixar as well as The Horse Whisperer, The Help and The Iron Lady.